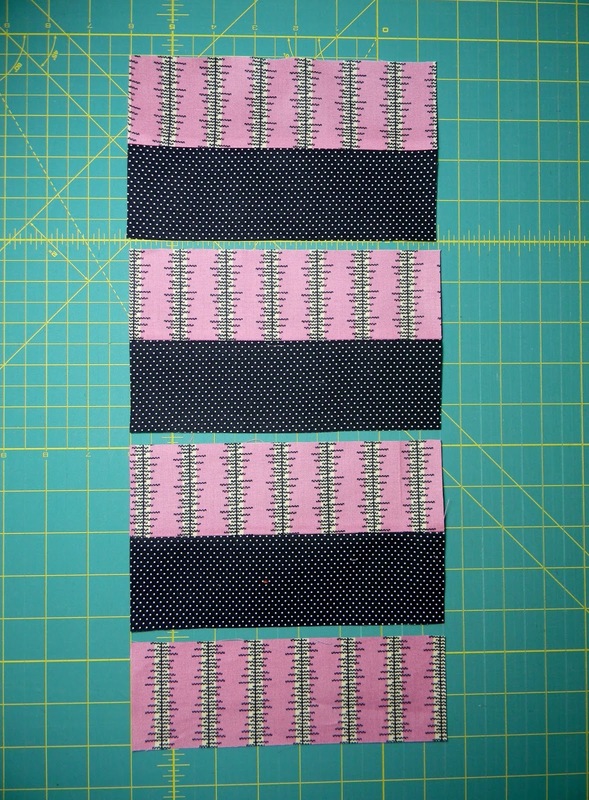 One of my scrap management techniques is to cut 2 1/2" strips from scrap pieces of fabric. The strips have been piling up, awaiting the right project, so when I saw this lovely photo by Samantha of Always Making Life Prettier, my mind went immediately to that box of jumbled strips. 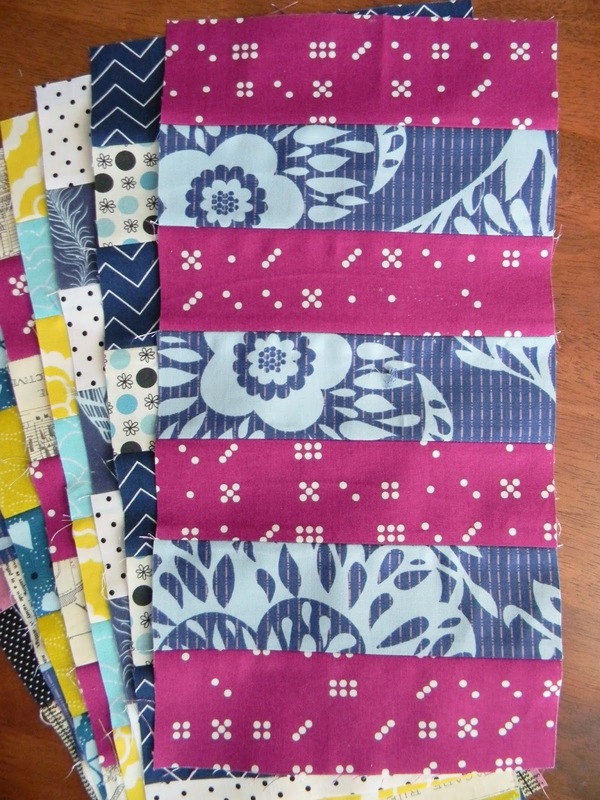 Samantha was kind enough to allow me to use her idea as the inspiration for a new quilt and this tutorial (and believe it or not, her blocks are only a starting point for a much more elaborate design). 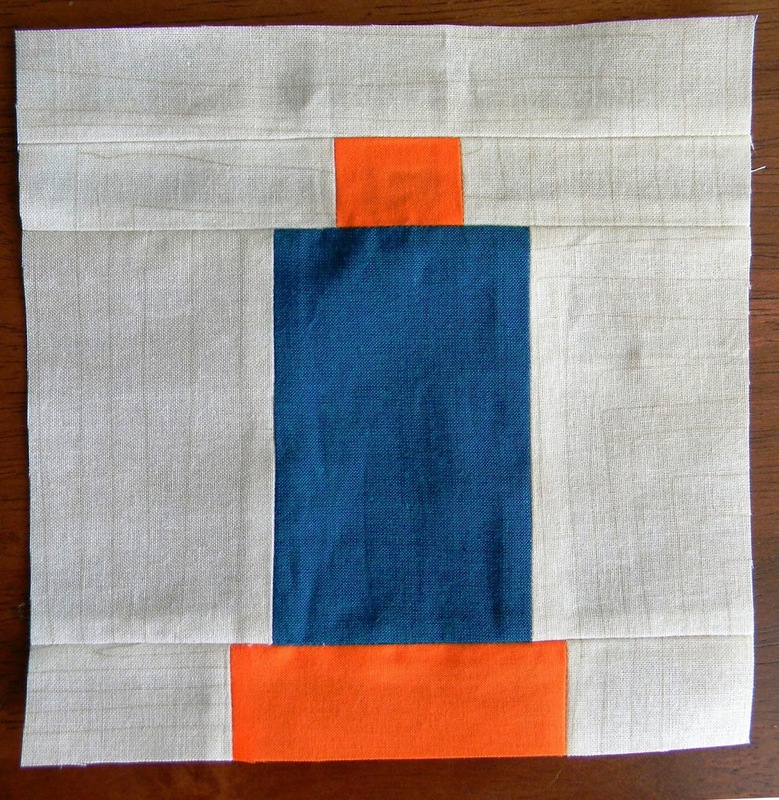 The Rugby Stripe block is extremely simple. 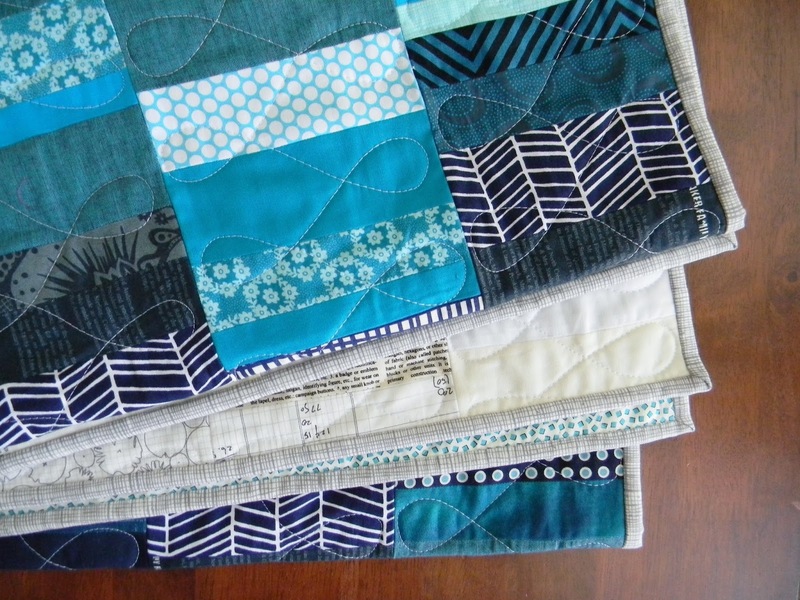 It is totally achievable for even a beginner, but it's also a great stash buster or way to use scraps for any quilter. 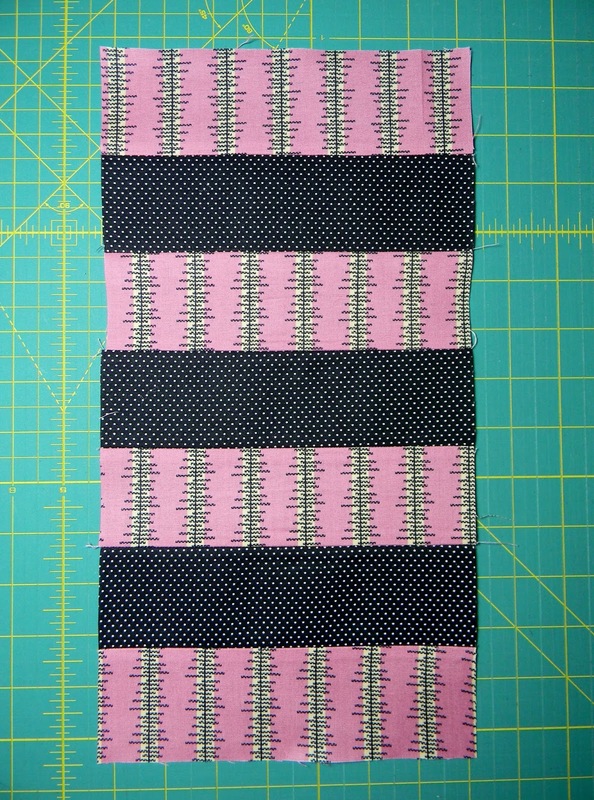 It's always nice to have a quick block for those fat eighth or fat quarter bundles or jelly rolls that doesn't require you to purchase a background fabric. 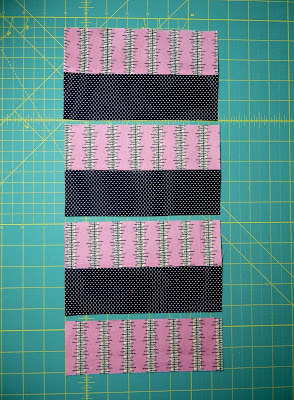 You can make a single Rugby Stripe block from two jelly roll strips, or simply use 2 1/2" strips cut from yardage, or scrap strips as I did, to create these 7" x 14" blocks. You will need 45 blocks for a 63" x 70" throw quilt or 21 blocks for a 35" x 42" baby quilt. 1 strip 2 1/2" x 23"
1 strip 2 1/2" x 7 1/2"
2. Sew the 2 1/2" x 23" strip of Fabric A to the same size strip of Fabric B. 3. 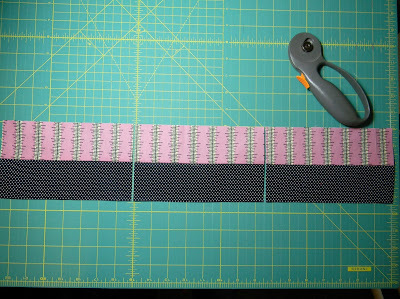 Press the seam as desired and sub cut the strip into 3 rectangles 4 1/2" x 7 1/2" each. I allowed an extra 1/2" wiggle room to trim away for perfectly straight edges. 4. 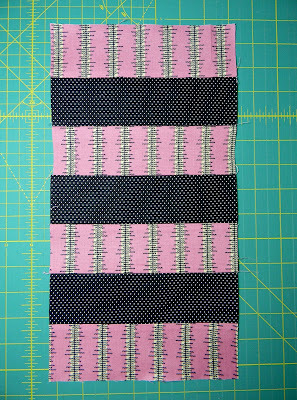 Sew together the three rectangles created in the previous step, alternating Fabrics A and B, and add the final 2 1/2" x 7 1/2" strip of Fabric A. That's it! These blocks sew up so quickly. 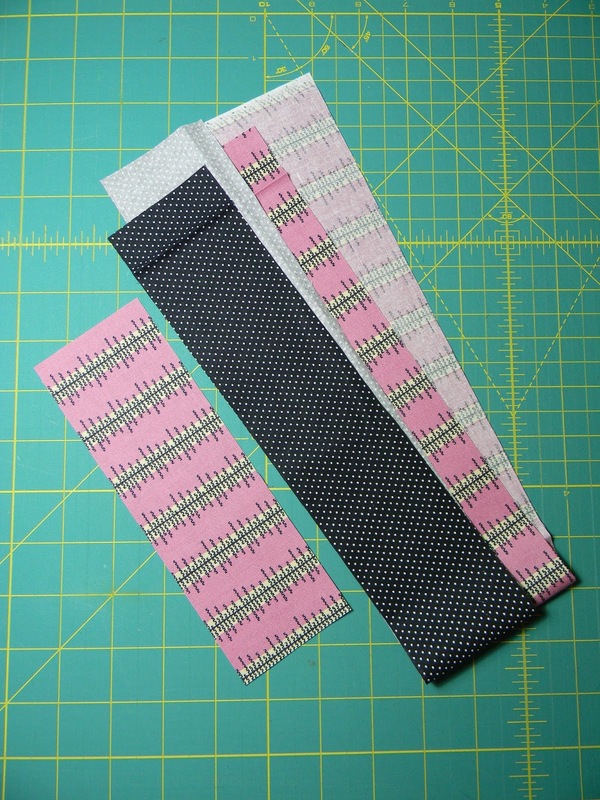 Of course, if you don't have strips or want to use fat eighths or fat quarters or smaller scraps, simply cut 4 rectangles of Fabric A and 3 rectangles of Fabric B, all 2 1/2" x 7 1/2" to make a single block. (FYI, if cut this way, two fat eighths will yield two blocks). Hope you enjoy the simple tutorial. I'll be finishing up the blocks for my throw to show soon. As I mentioned before, my younger son was concerned that the Busy City quilt was missing trash cans. Well, no more. Now every house can have its own roll out recycling and garbage bins, if you share his concern. I will make the pattern for the bins a free download when I release the free wall hanging pattern. Have you seen Carla's cute Busy City blocks? They are perfect! 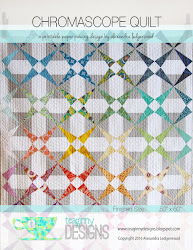 She is also giving away a pattern today, so stop by her blog Lollyquiltz to enter. If you want to join in, there is an informal Busy City Quilt Along starting up over on Instagram, just tag your photos #busycityquilt or add it to the Flickr Group. It won't begin for a couple of weeks, so you've got time to get the pattern and gather your fabrics. 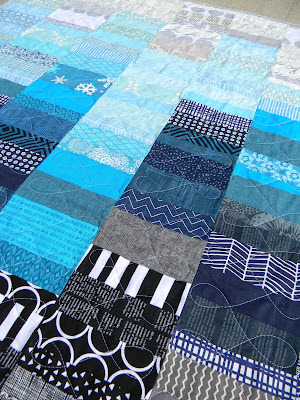 I've been back at my therapy, working with scraps to make more monochromatic strip set blocks. The technique is the same as I used in the Therapist. 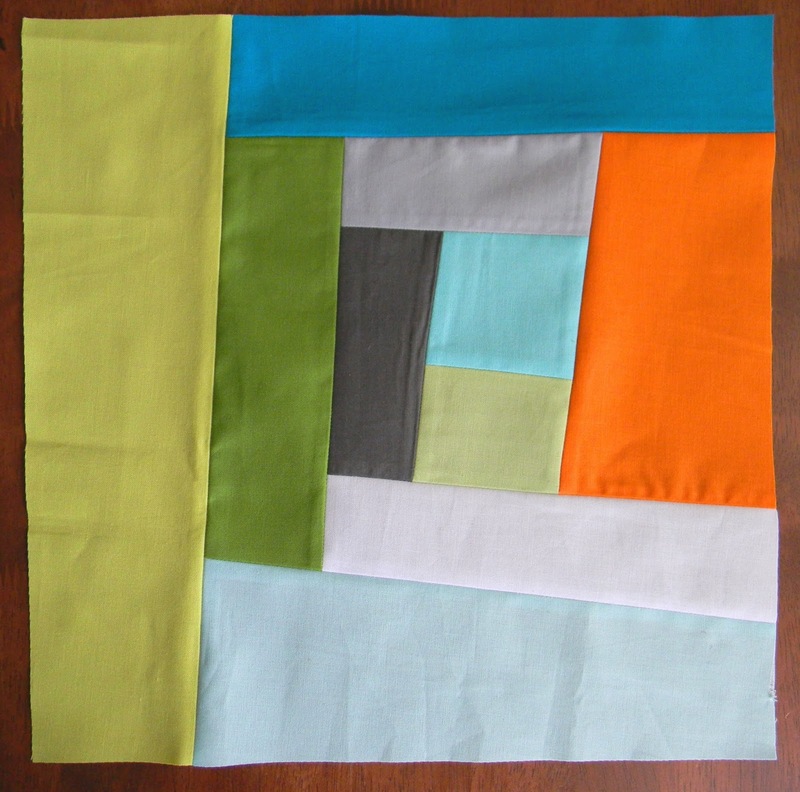 I simply limited my color palette to create this 40 x 50 toddler quilt. 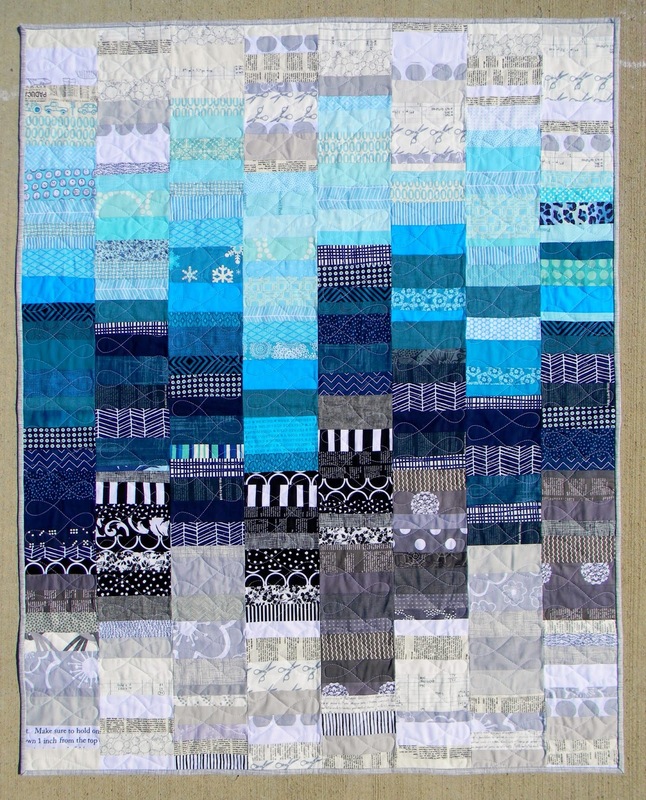 The intensity of the teal and navy is what I find so arresting about this quilt. I wanted the colors to gradually soften into aqua on one end and gray on the other, finally fading to white. I used the block format to keep it deliberately a bit choppy and graphic. The blocks are quite simple to make as well and more much more manageable than making an entire column at a time. 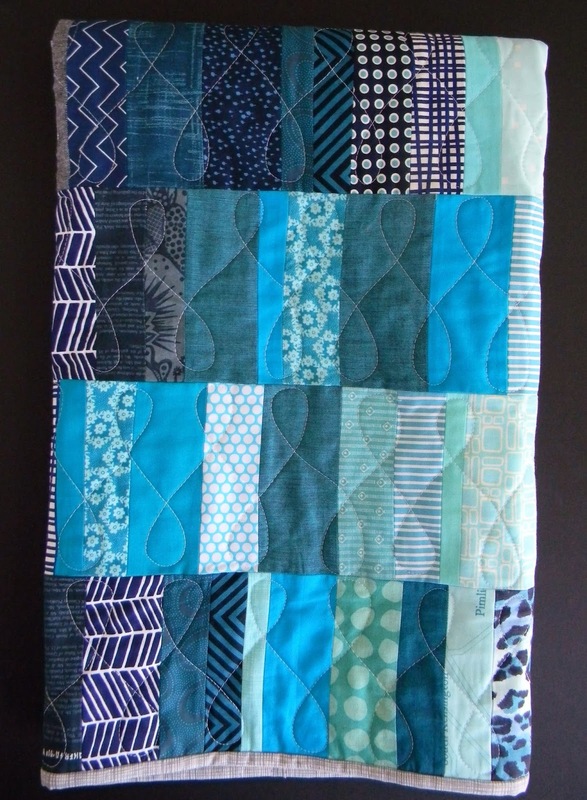 The tight color scheme creates cohesion even though it is a very scrappy quilt. 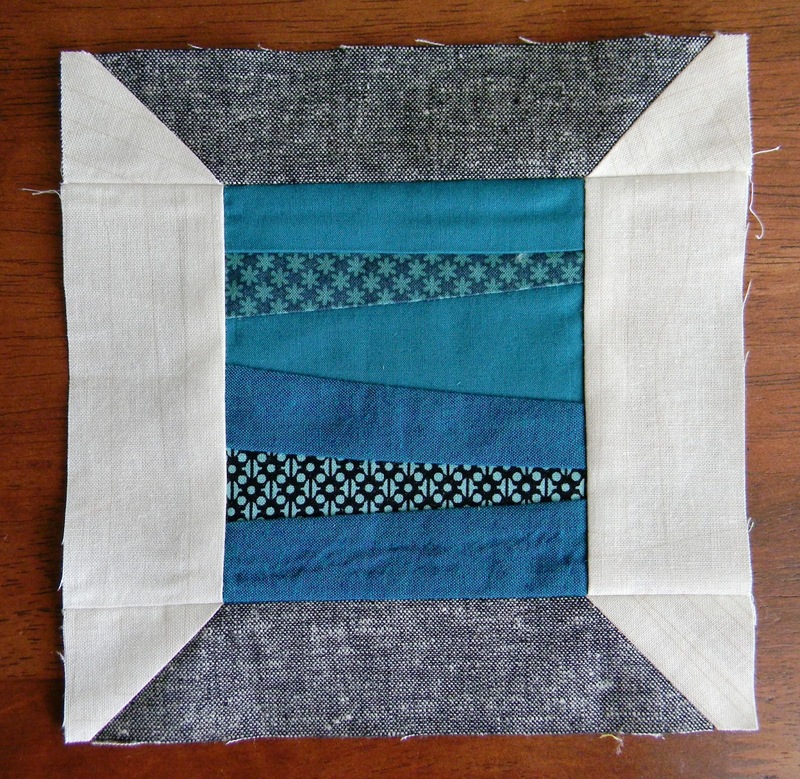 I really enjoyed working with both my own scraps and scraps from friends. 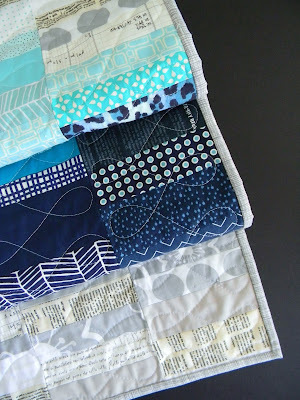 (If you want to make a scrap quilt but don't have enough variety of fabrics or have colors you lack, I suggest swapping scraps with a friend or two. 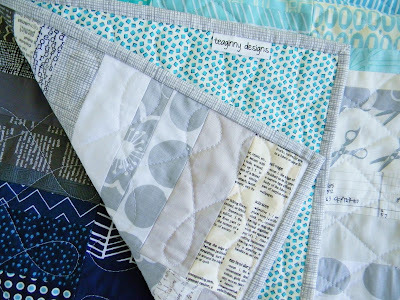 It is a fun way to discover new fabrics and work with colors you might not normally use. Scrap packs are also readily available for purchase online. 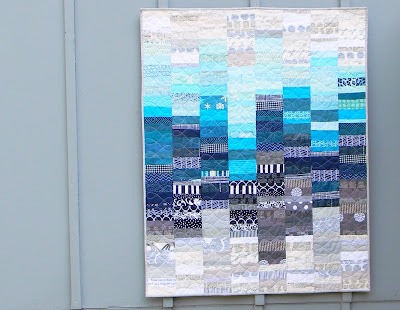 One tip I can offer is to follow quilters you admire on Instagram or Flickr. If you like the fabrics they use in their quilts, you're sure to love a scrap bundle, should they ever decide to destash. Guess how I know.) My friends may recognize some of their scraps here. 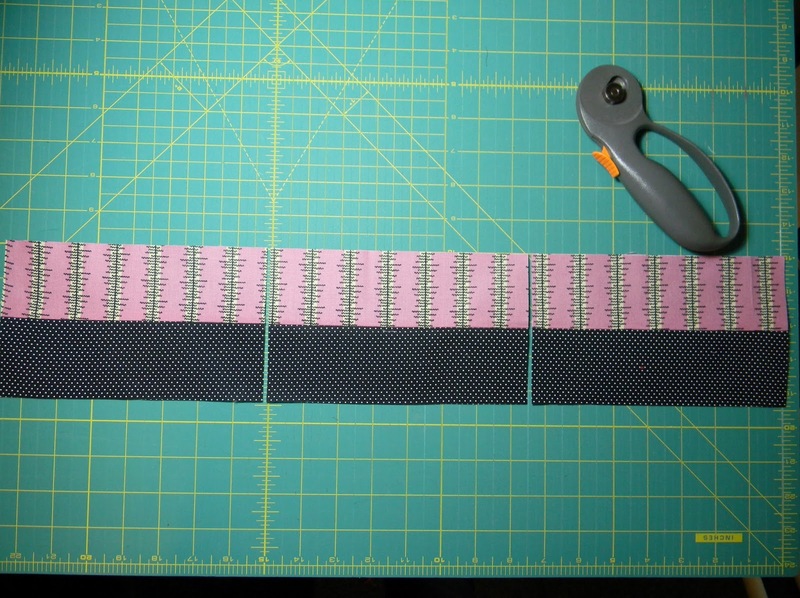 I used a figure eight free motion design for the quilting and simple gray Heath to bind. The back is a cute DS Quilts print you can find at JoAnn's. Partly Cloudy is available in my shop. FYI, I am planning to clear out the shop in the next month or two, so it's your last chance to grab anything you've had your eye on. All the baby quilts unsold by the end of September will be donated for the 100 Quilts for Kids quilt drive. It's been a few years since I've participated in a virtual quilting bee. I'm excited to join a couple of new bees with friends from my local KCMQG. My first blocks are for Shea in the Crossing Borders Bee (at least I think that's name we settled on), who requested 6" x 6 " or 6" x 12" spool blocks and sent us some scraps to work with. I was very happy to get to work with my favorite color. I just had to make an Aurifil spool too. The next block is a wonky log cabin in Quilt Con colors. This is for the Blessing Bee which is a project for the guild as a whole, put together by the Community Service Committee. Each month, members may make any number of 12" x 12" blocks they wish in one of three styles: wonky log cabin in these colors, wonky stars in pink and lime, or square in a square in orange and aqua. Other members have signed up to assemble tops, make backing, quilt and bind. I think this is such a great arrangement for a a bee, allowing everyone to help as they are able. The types of blocks may change every few months, and of course, members are welcome to donate completed quilts they have made themselves. Finished baby quilts will be donated to a local organization that gives birthday cakes and other things to children who would otherwise not have a birthday celebration. We are hoping to provide enough quilts for all the children turning 1, with hopes to expand if we are able. I'm looking forward to more bee blocks! The winner of the Busy City giveaway is Laura, a mom of three boys (!) and member of the St. Louis MQG. I've sent you an email, Laura. My younger son is clamoring for his own Busy City quilt, and he wants me to add a block that somehow got overlooked: trashcans. I have a fun wall hanging planned, and I'll share the layout as a free download when I get a chance (you'll still need to buy the pattern for the block templates). 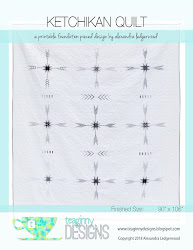 You can find the pattern online at Pink Chalk or at the Bernina store, locally, on Metcalf. It is shipping to more stores right now, and feel free to ask about Empty Bobbin patterns at your local shop. Well before he was even 18 months old, my first son would point and hoot at every truck or digger he spotted through the window from his car seat. By three, he could distinguish backhoes from front end loaders and correct me on the finer points of cranes and forklifts. When he was ready to move to a big boy bed, I knew I had to make a construction themed quilt for him. I found there to be so little on the market for boys and definitely nothing that would appeal both to his interests and my own modern aesthetic. I'm pleased to say that Busy City, a pattern I created as a licensed designer for Empty Bobbin Sewing Studio, does just that. 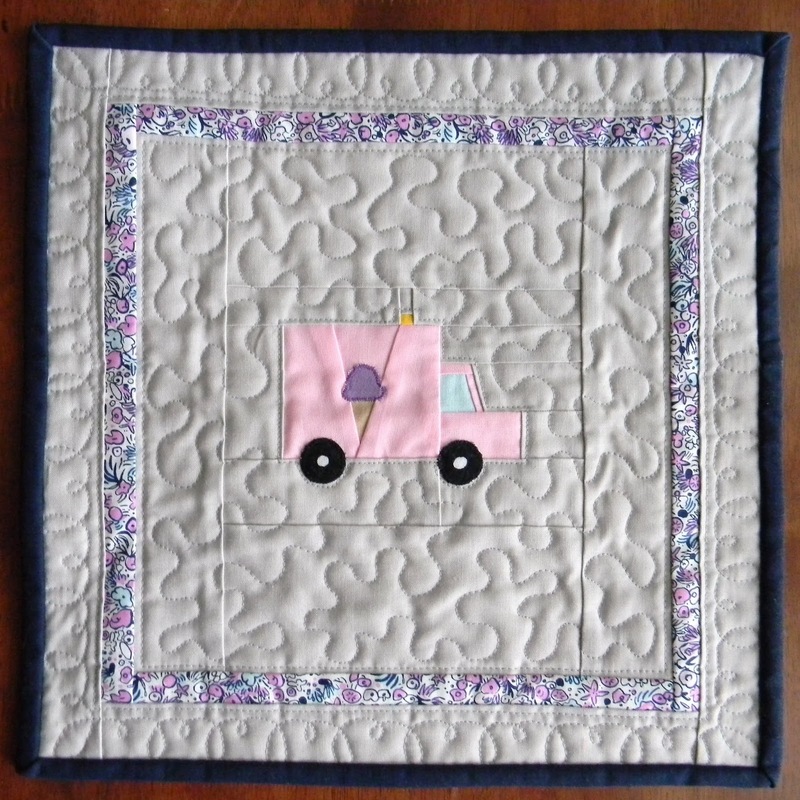 It is inspired by the quilt I designed and made for my construction crazy four year old. It includes so many of the things little people notice all around them in the busy city. Each project is designed to be customizable in a number of ways. Not only can they be made with just the blocks you choose, the blocks are grouped by level of difficulty. 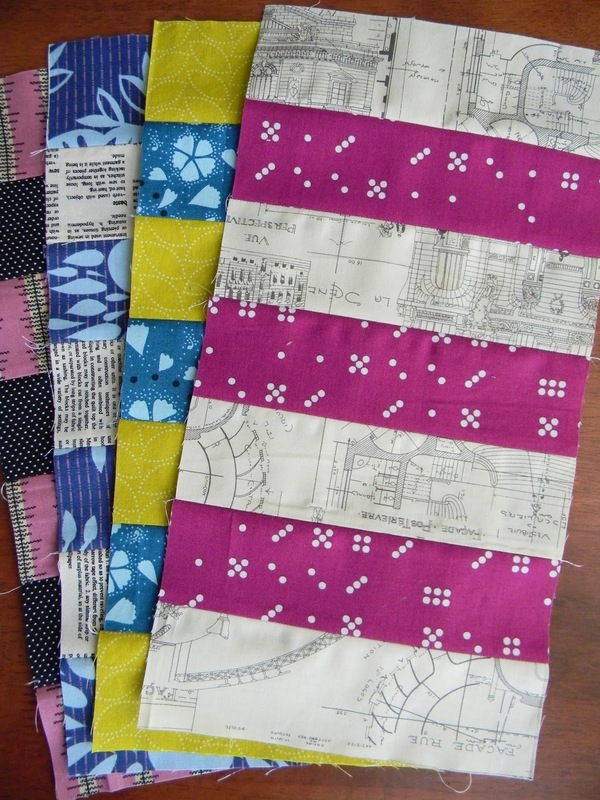 Quilters who are less experienced with paper piecing, have no fear! 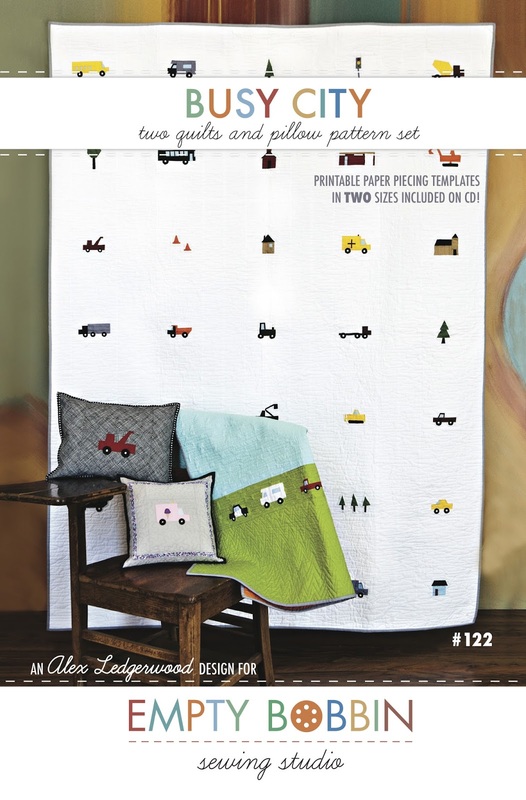 Detailed paper piecing instructions are included, and you can begin with the simplest blocks or choose to use only those blocks in your project. Those more comfortable with paper piecing can tackle the more detailed blocks, although all the blocks are suitable for intermediate quilters. 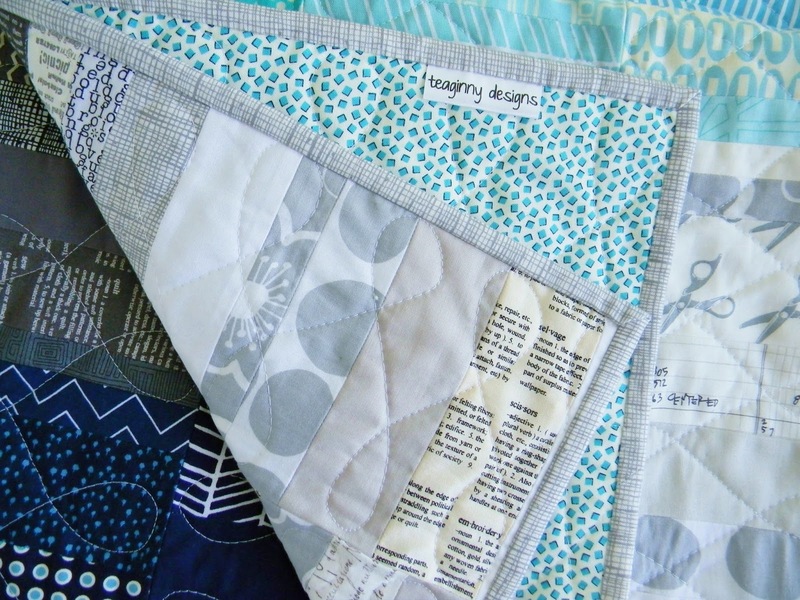 The baby quilt and pillows are quick projects that use just a block or a few blocks, and of course the heirloom twin quilt uses 35 blocks. All the block patterns are included on a CD, so you can print out just the ones you want to use in two size options. There is no need to photo copy or trace patterns. Yay! The projects are so easy to tailor to your child’s specific interests. 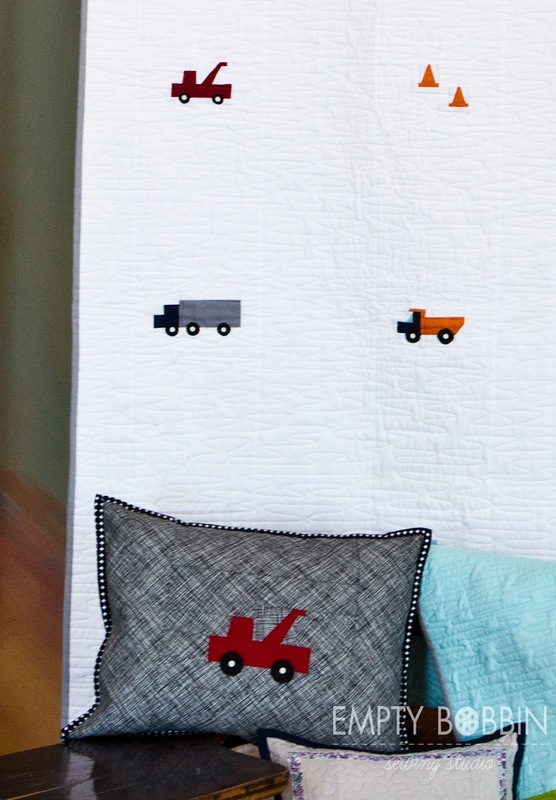 If your little one is into farming, you can use the tractor, pickup truck, and barn blocks. The house becomes a farm house and the trees an orchard. If he is interested in race cars, you can make a pack of cars in different colors and include the tow truck and ambulance on the sidelines. You can make a charming little neighborhood of houses and trees with a school bus. 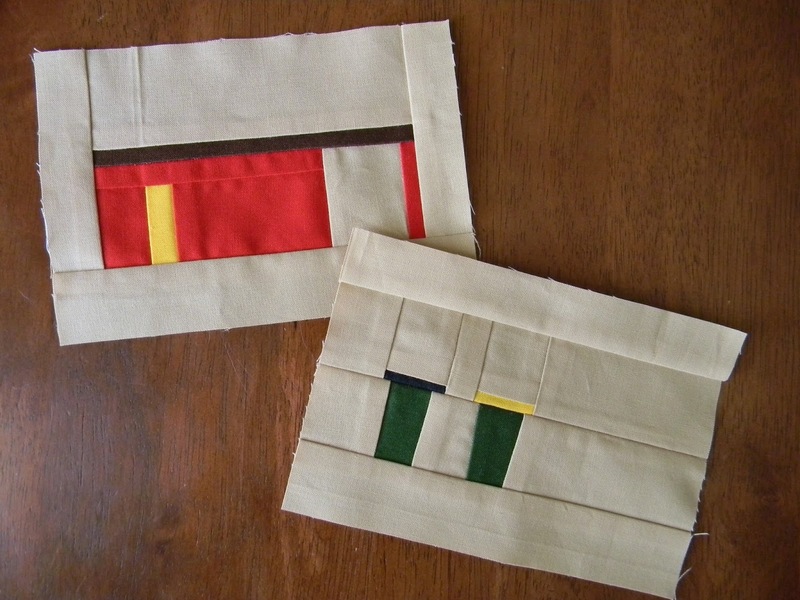 The possibilities are as numerous as the children for whom you sew, both boys and girls! I made this 12 inch pillow cover for my new niece. 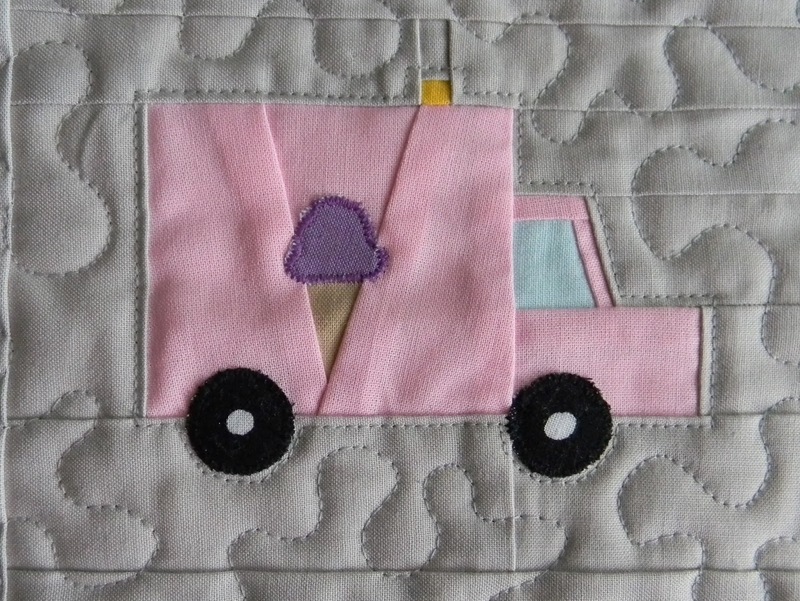 Each block pattern is paper pieced, with additional templates to create wheels and treads which are appliquéd onto the completed block. 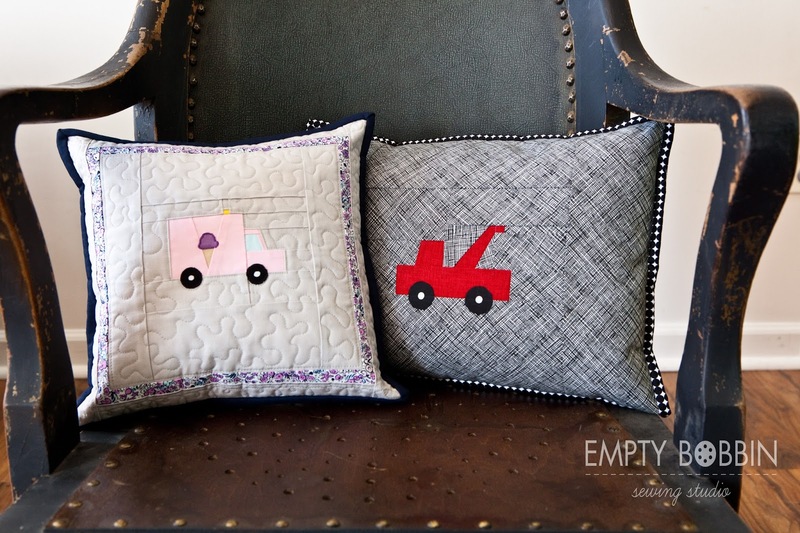 By using black fabric with white polka dots, you can mimic the look of tires while using a single piece of fabric for each wheel. I used fusible web and machine appliqué, although you can pick the appliqué method of your choice. 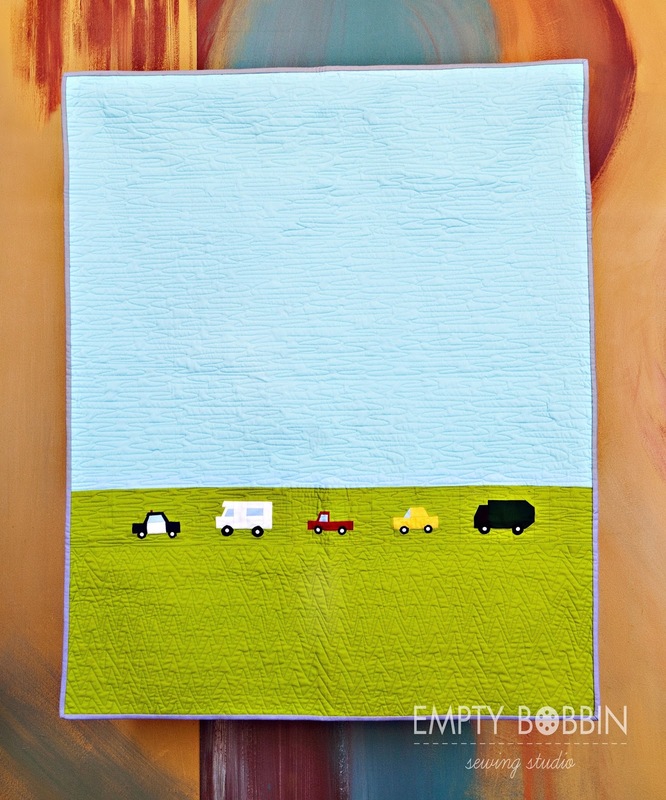 I'm so excited to partner with Empty Bobbin Sewing Studio to publish this pattern. 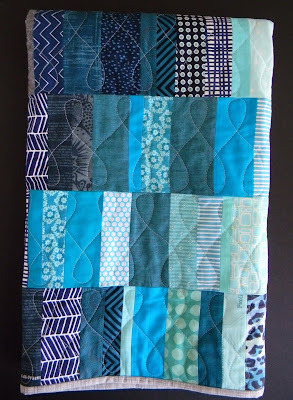 It is especially fitting because Shea was the one who first encouraged me to create a pattern for this quilt. My response was, "No way." Ha! But that seed of an idea stayed with me, and once I had the pattern writing experience and the appropriate software, this pattern grew. Here is a list of places you can purchase Empty Bobbin Sewing Studio patterns. Busy City is shipping to stores now and is already available at Pink Chalk, Superbuzzy, I Don't Do Dishes on etsy, Hyggeligt in Canada, and locally at the Bernina store on Metcalf and Sarah's Fabrics in Lawrence, KS. Update: Busy City is now available for purchase as a digital download from Empty Bobbin. Download the pdf here. As always, I would absolutely love to see what you make with my pattern. You can email me or upload a picture directly to the flickr group. Those of you who are still reading definitely deserve a shot at a free pattern. Leave a comment, and I will choose a winner, at random, Saturday morning. Does someone come to mind when you look at this pattern? What blocks do you think he or she would like best? For a second chance to win, hop over to Shea's blog where she is also offering a giveaway. Giveaway now closed.